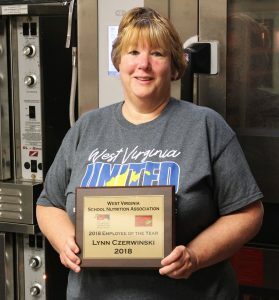 John Marshall High School Cook Lynn Czerwinski is once again the West Virginia School Nutrition Association (SNA) Employee of the Year. This is the second time, in the past four years, she has won this statewide award. Czerwinski is recognized for her dedication to the field of Child Nutrition since being hired by Marshall County Schools in 2007. In order to be nominated for the award, she not only had to exhibit characteristics of an outstanding Child Nutrition professional but be recommended by peers and hold a membership to the SNA. Czerwinski received a plaque and a $1,000 scholarship from the West Virginia Department of Education’s Office of Child Nutrition to attend the SNA National Conference in July, where she will be recognized.